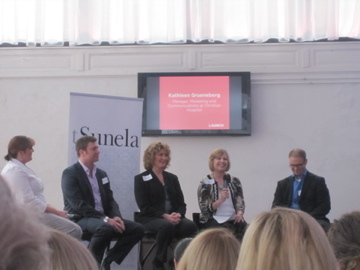 Tonight I attended a social media event put on my Alive Magazine and tSunela, a digital marketing firm. 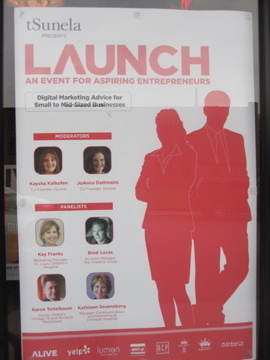 The event was called “Launch: Digital Marketing Advice for Small to Medium Sized Businesses”. 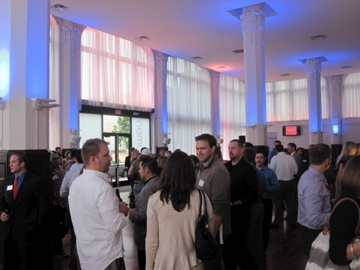 It began with a cocktail and networking hour and then the main event was a panel of local marketing directors that spoke about how they utilize social media. I was a bit nervous to attend this on my own, but figured I have to grow up some time! I grabbed a beer when I got there and quickly began chatting with two guys. One of the guys (Hi Dave!) and I SWORE we both recognized each other, but after talking for a while we still couldn’t figure out how. Turns out his friend that was there also recognized me but we seriously don’t know each other. So strange. Anyway, hearing from the marketing managers was interesting but definitely geared more towards a company larger than just..say…me. It’d be nice if my blog had a budget for social media:) Some important things were reinforced though, such as using Search Engine Optimization techniques like keywords, making sure you keep your social media accounts active, and reaching out to where your target demographic will be. One of my favorite quotes of the night was “Social Media is a tool, just like a hammer. Some people will build a beautiful house with it, but some people will just bang a hole in a wall”. Social Medial needs to be used properly! I could definitely stand to better my skills. I had a couple of snacks this afternoon since I knew I wouldn’t be getting home until later. 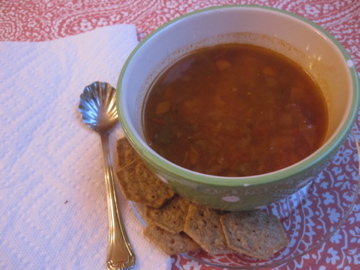 Once home I quickly heated up a bowl of Amy’s Minestrone soup and had it along side a serving in Wheat Thins. 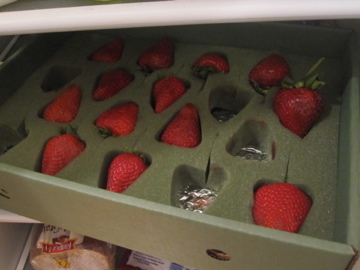 …along with quite honestly the biggest, sweetest, strawberries you’ve ever seen. I found this Harry & David box in the refrigerator this morning. I guess my Dad brought it home from work. Just check out one in the palm of my hand! Off to bed! SO glad tomorrow is Friday! How into Social Media are you? Just Facebook? Or do you tweet and Youtube up a storm? I was always a late starter with social media. The last of my friends to get Facebook in high school and I only got Twitter for blog purposes. But I love it now! There is so much great connecting that goes on. I love Social Media – I think it’s a great tool. I’m a tweeter (read: obsessed) and really have been enjoying using my FB page! I love social media now too! I hated twitter before but now with blogging I love it! hard for me to get into twitter, dunno why! i just made the pseudo vegan’s FB page and am really excited! I love giant strawberries! I use facebook and Twitter on occasion. Anything else and I would have no life, so I try to avoid too much networking on the computer! Haha, social media is the death of my productivity. Hopefully it’ll be more useful once I graduate, and I won’t be using it just to distract myself from essay writing/reading. Teehee, I bet those guys “recognizing” you was a cover up for wanting to get to know you better 😉 😉 jk, delete this comment if that’s inappropro haha. WOW. Those strawberries are ENORMOUS. Right now, I am limited ot just twitter for my blog – but I have a personal facebook account. Eventually I will link up my blog with a facebook account too! 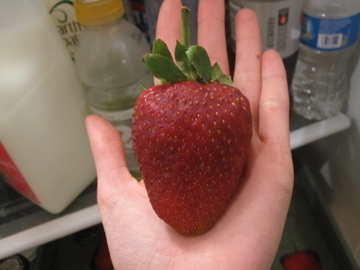 Wow, that’s the biggest strawberry I have ever seen!!!!!!!!!!!!! 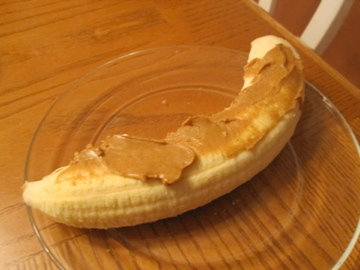 The fruit that’s a meal! My job involves a lot of social media–I tweet and post on our facebook page every day. A great tip from my boss is to be interactive with facebook/twitter–engage your readers by taking an active interest in their experiences and ask what they would like to see on twitter/facebook posts. I usually just facebook but I tweet as well….ever since my schedule got super crazy I haven’t been using twitter as much (i don’t have internet on my phone) but I think once I got that I would be more in touch with the social media! Good grief, that strawberry is insane!